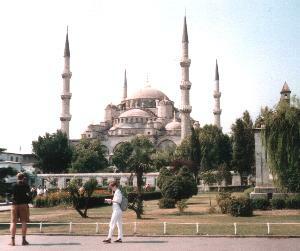 ISTANBUL, AUGUST 1991 - "The gulf war has just ended, prices are very low, the destination not overcrowed, so let's go... ! 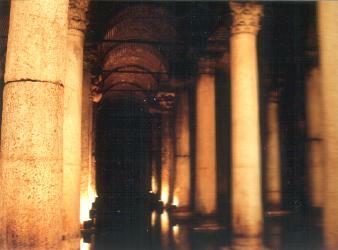 But let's return to Istanbul, this fascinating capital, where the adventure starts and we meet another culture. After our first disputes with taxi drivers, we decided to take the bus into town.... Finding a place to sleep for a couple of days was not difficult, there were vacancies in most of the places. We stayed in a budget pension, in the middle of the old city, next to a mosque... as we found out the first morning at 5:00 AM when the muezzin called for the first prayer of the day from the minaret. We ate kebab, corn, and simit (a doughnut-shaped sesame bread) from the food stalls - or fresh fish in a restaurant on the Gatata bridge - the old one , that collapsed some years ago, now replaced by a new one. We had a great time, and we were all millionaires... - every time we changed our US $ into Turkish Lira, the exchange rate went up... inflation was 70 percent or more over here. 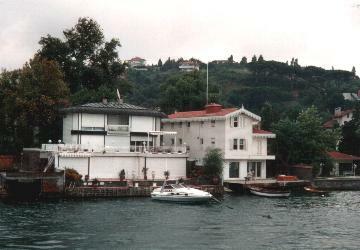 One of the following days, we went on a boat trip on the Bosphorus, the gateway to Asia.... Along the river, many interesting buildings and sights... but this was not a tourist-only boat, as it was also used by turkish vendors, people going from and to work, or for shopping into town. 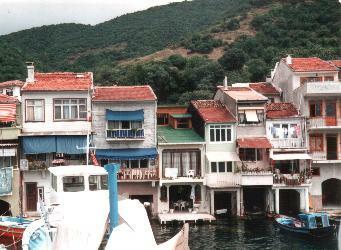 This boat trip was also a place to experience day to day life in Istanbul. We spent a couple of hours in the little town Anadolu, on the coast of the Black Sea. We had crossed the border with Asia. Again fresh fish and calamares... ! But also little streets and poor housing. This was different from the splendors of the historical old city of Istanbul. When we arrived back into the city, I remember the abundance of fresh fish from the many fishermen - the fish were still alive when sold !